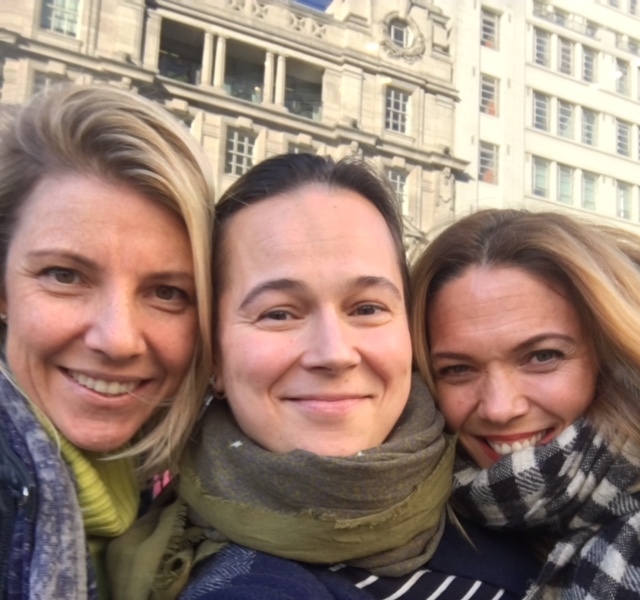 My first meeting with Helena Chapman & Maja Griffith, founders of the British natural brand Rosalena Skincare, happened during London Fashion week in September. As their products, face oils & Goodness & Tonic face mist, were used by the MUA Eoin Whelan & his team during models skincare prep for the Irish designer Joanne Hynes fashion show, I was invited to peak backstage at One Horse Guards Avenue (well roam is rather more accurate, as we left no corner unobserved, driven by child-like sense of wonder). That invite turned out to be one of the best morning work meetings I have had this year. Helena & Maja are like chalk & cheese in some ways, one dark-haired, another blond. One quieter by nature, another like a force of nature. But together not only are they powerful, inspiring (they have five kids between the two of them) & passionate about Rosalena & the message they send to their customers with each product, but they have the most genuine belly laughs and every time I meet up with them, we all end up giggling our heads off, as we go through various subjects, most of which relating to work. Humour is such a rare thing, as many of us take life seriously, trying to combine many roles and keeping on top of the various problems we face daily, yet when you are immersed in it, it lightens the heart and the load that you carry on your shoulders. Maja & Helena launched Rosalena three years ago, researching things for two years prior to that. The brand was born not only from their passion for natural skincare, but from their strong desire to allow their customers, 95% of which are women of various ages, to have special daily skincare rituals. Those rituals not only nurture the skin, but revitalise or calm the mind, depending on the time of the day. Our skin is constantly affected by what happens around us, the time of the year, the elements, as well as our genes, hormones, our diet & stress levels. Some of those factors, like weather, we can’t control, but others we can & should take responsibility for. Helena & Maja created four beautiful face oils, as well as the above mentioned and much loved Goodness & Tonic face mist, which allow you to enjoy your skincare rituals & make the skin look better, irrespective of what life throws at you. Both women are adamant that their products will allow you to enjoy the experience of using them, as much as the results you will see in the mirror. All is takes is applying one product after you cleanse your skin, taking the time to smell it & be mindful, as you massage the oil into your skin & neck. Simplicity at its best! What started as a passionate hobby for both women, is now a business, because many friends & family members liked the samples of the products so much, that they urged them to create full sized products. Products that are made from natural ingredients & are chosen for various benefits that they bring to the skin. Maja & Helena wanted the products to have integrity, bring tangible results with regular use, smell beautiful, and to help their customers look after their skin in a naturally effective & holistic way. They were also conscious of the price point & set it at the level where a customer wouldn’t feel guilty. Something that as consumer myself I am more and more aware of – with organic & natural skincare & make-up gaining momentum & popularity, brands are starting to increase their prices or raise it to such a level that it restricts access for average consumer. Personally I believe that good skincare should be affordable to anyone who cares not only about the way they look, but about what they actually put on their skin. Each of the four oils, “Beauty & the Beast“, “Love & Me“, “Rock & Rose” and “Frank & Sense” has its own distinct personality & will address different needs of your skin, while “Goodness & Tonic” is a fun mist to be used for spritzing your face in the morning, evening & during the day to refresh the skin & the senses. Ultimately the best people to tell you about Rosalena are Maja & Helena, so below is the Q & A, which will hopefully allow you to glimpse into their world & help you understand what makes Rosalena Skincare special in more ways than one. GAP: How did you two meet? HC & MG: Through our children, who went to the same nursery school. Rosalena was hatched on the sidelines of a football club, when we got chatting about not being able to buy what we wanted. In-between snack breaks and loo trips we quickly realized we shared a vision for developing a skincare range that delivered healthy, glowing skin without the use of chemicals; beautifully smelling products and where the experience of using it was to be as wondrous, as the results. We couldn’t find a product that ticked all these boxes. We wanted a range of natural face oils that could be used every day, in one simple application and not just as a treat, but daily, incorporating some guilt free ‘me-time’ into a personalised ritual, so we made it ourselves and the rest is history! GAP: What are you professional backgrounds & how do you share responsibilities when it comes to Rosalena? HC & MG: Our backgrounds are varied and have nothing really to do with skincare! Helena has a psychology degree and a sales background, Maja comes from marketing and PR. One of the best things about our partnership is recognizing the strengths in each other. Maja is the ‘yin’ to Helena’s ‘yang’, we each have completely different skill sets and are willing to accept what we can and can’t do. We are both the brains – but our brains operate very differently. Maja is the organized one, the pragmatist, the steady hands on the tiller that ensures we have everything in line and preplanned. Helena is the ‘go for it’, ‘the aim for the sky’, ‘try it’, ‘do it’, ‘think outside the box’ part of the duo. We are both identical though, when it comes to our passions: ingredient integrity, work-life balance and enjoying the journey. We 100% have each others back and respect each other and the decisions we make, supporting one another not just in the business, but with whatever is thrown at us in life generally. GAP: What does the name ‘Rosalena’ mean and why did you choose it for your brand? HC & MG: Rosalena is, contrary to common belief, not a mash up of both of our names, or demonstrative of the use of Rose in everything (we don’t). We wanted an identity that was representative of our brand: a mix of antiquity with the contemporary. We combine modern cutting-edge technology with ancient wisdom. Rosalena could be a name for your daughter today or one that was your grandmother’s. We are vehemently anti ‘anti-ageing’, so this timelessness was important, as was the beauty of the name. GAP: What makes Rosalena different from other beauty brands on the market? HC & MG: What makes us stand out? Delivering shine-free hydration with an oil, not a cream – we love smashing the myth that oils can make you greasy! We designed our products to please most oil-phobic customer! Customers say we stand out because of our quirky product names, their unique smell and function, the way in which they’re used, the fact that they’re completely natural and the results, i.e. the famous Rosalena Glow which speaks for itself. But to us personally, we think we are different because unlike serums and treatment oils, we created a daily moisturising face oil, so you don’t need anything else. One step, multi-tasking, easy to use. Our range is also unique in that it engages the user to make daily personal choices (from our range of four face oils), based on how they feel on that particular day, both in terms of emotions and their skincare needs. We are proud to be experiential and encourage the use of our mantra ‘Pause, Breathe, Be’, when applying the oil, in order to enable the application to be as beneficial, as the results you will see. GAP: Why did you choose to take the ‘natural’ route when it comes to your skincare products? Why do you advocate using natural skincare to other women? HC & MG: Put it this way, if I could guarantee you that switching to a natural skincare product would give you the same, if not better, results than products which contains health compromising ingredients, would you swap? We’re pretty certain the answer is going to be ‘yes’. We wanted to offer a genuine alternative to the widely accepted and used, chemically-laden skincare. Firstly, because it’s simply better for you. Better for your overall health and actually better for your skin too! Parabens wreak havoc with our complexions for example. Secondly, because the beautiful, pure plant base element of Rosalena connects us with nature, which can encourage a sense of wellbeing. Many of us are conscious and discerning over what we eat and drink, choosing a (generally) healthy lifestyle, which is widely accepted as resulting in us feeling good, and this is true for skincare too. Don’t get us wrong, we don’t mind a good glass of wine and some chocolate, but that decision is made with insight and intension. So many people don’t know what is in their skincare products and the damage that can be potentially done by absorbing toxic chemicals. Or wrongly believe that without a long list of scientifically sounding ingredients they simply won’t work. We love showing people that Rosalena is both natural and impactful. GAP: Do you have any role models in the professional beauty field? HC & MG: We are constantly inspired by so many wonderful people in the beauty industry. Initially, we were inspired by Liz Earl, specifically her simple approach to skincare using botanical ingredients. We are thankful to the amazing REN for paving the way for Clean Skincare. We were fortunate enough to have met Rob Calcroft and we hung on his every word! From bloggers to make-up artists, we have found the beauty field to be supportive, fun and one that has only been positive. As far as role models go, there is one woman that stands out. Nancy Cruickshank of My Showcase has the most amazing amount of energy, her enthusiasm and passion are contagious, she is knowledgeable beyond belief, commercially savvy and also very kind – not a common mixture. Plus, she has a laugh that is dirtier than Helena’s and that’s saying something! GAP: Why do you prefer using face oils to serums or moisturisers? HC & MG: We love and can talk for days about the virtues of face oils! In a nutshell, oils penetrate at a far deeper molecular level, moisturise better for longer than creams can and also carry with them all the goodness of pure plant ingredients, right to where they are needed. What’s not to love? GAP: Would you recommend them to people with oily skin or teenagers, who are going through hormonal changes? HC & MG: Yes and yes!!! Oily skin benefits hugely from using a good quality, natural face oil. This is because certain plant oils ‘mimi skin’s natural sebum, so the skin senses there is already enough oil and so it doesn’t need to generate as much, which therefore balances and controls oil production. Teenagers or indeed anyone with hormonal imbalances should use face oils since the natural ingredients are more gentle and therefore less likely to inflame, irritate and clog pores and can actually reduce oil production and greasiness. GAP: Please tell me about each of your face oils, particularly when it comes to skin types. What are your best tips on applying them to the face? HC & MG: Elaine Tomkins, our Senior Face Fit Therapist, recommends stimulating facial muscles by massaging the oils into the skin, thereby increasing circulation, lymphatic draining and absorption. Additionally, taking a moment to inhale the aromatherapeutic scents will allow to create some inner calm, which is just as good for your skin, as the GLOW! Rock & Rose Face Oil: Our radiance booster. Great for skin that needs a boost of brightness, uplifting and radiance. This award-winning face oil is perfect for the morning after the night before to illuminate your complexion and energize your skin and mind. Frank & Sense Face Oil: Great for after sun repair treatment and to combat the drying effects of winter or as a super hydrating skin treatment. Get your glow whatever the weather! Love & Me Face Oil: Ideal for sensitive skin that needs gentle hydration, it balances redness, hormonal breakouts and protects from environmental stresses by nourishing the skin & helping create an even, healthy and vibrant complexion. Beauty & the Beat Face Oil: Our unisex face oil. Amazing as a pre make-up primer due to its matt finish and also as a post-shaver soothing and energizing face oil for your beast! A perfect morning moisture boost and a night time nourisher for both men and women. GAP: What skincare advice can you give for the colder months of the year? HC & MG: Use our ‘Frank & Sense’! We developed this oil to cope with all kinds of weather, sun, ski and the transitions in-between. For the colder months, the combination of oils and bio-active ingredients help combat the drying effects of indoor heating, as well as soothing the skin after the harsh exposure to the cold. It’s a natural anti-inflammatory to calm skin, tame redness, support collagen production and absorb free radical damage (the sun still shines in winter!). GAP: If you could choose one face oil each from your range of four, which one would be the favourite? HC & MG: For Maja, it’s ‘Frank & Sense’, because she is a skier and a surfer and won’t go on the piste or in the sea without it now, having seen ‘in action’ the incredibly repairing, restorative and soothing qualities it yields. Having grown up in South Africa, she also wanted something to address sun damage, which was central to the selection of oils we chose when we developed this oil. Helena’s fave is ‘Rock & Rose’. She loves the noticeable lift and glow it gives, and is often in need of a bit of a boost after a late night! GAP: When it comes to morning & evening skincare routines, which of your oils would you chose & why? HC & MG: The beauty of Roalena is that we are not beholden to restrictive, prescriptive skincare routines. All our oils can be used both morning and night, and we purpisefully set out to encourage self diagnosis/selection of which oil to use when. We want our clients to get to know their skin, have an awareness of their needs, both emotionally and skin-wise, and then choose appropriately. As opposed to being told by someone far less in touch with the ever changing needs of our skin and souls! GAP: What are your daily skincare musts? HC & MG: Rosalena! Water. Laughing, cake and making the time for a ‘Pause Breathe Be’ moment daily. GAP: Do you have particular favourite skincare ingredients that are beneficial to skin irrespective of one’s age? HC & MG: Rosehip CO2 extract and Vitamin E are the only two ingredients we use in each of our face oils. This is because they are suitable for everyone regardless of age, sensitivities and skin type, and are both so incredibly good for our skin. Both are packed with high-potency, therapeutic benefits that deliver targeted help to fight skin stresses like ultraviolet light, changing temperatures and pollution. We are all exposed to these aggressors, wherever we are, whatever age we are and that means free radical damage, which results in wrinkles, lines, dehydration and loss of youthful volume. So we wanted fighting action in every oil we made to help combat this and that’s what you get with every Rosalena Face Oil – and more! GAP: Are there any cardinal rules when it comes to maintaining good, healthy skin? HC & MG: The biggest mistake people make is 1) Being scared that face oils will make your skin greasy and 2) Over-cleansing. We tend to strip our skin of oil when cleaning, striving for a squeaky clean feel post cleanse, which really disrupts the fragile balance. Then we enter a cycle of dry/hydrate, dry/hydrate. All of this can be avoided with a natural, oil-based gentle cleanser that respects the delicate balance, whilst still delivering ‘clean’ skin. If only this existed……Oh how we wish it did, ummm, I wonder if it ever will!!!!! GAP: What are your plans for the brand going forward? HC & MG: See above – cleanser NEEDED!!!!! !